I will never forget the first time I tasted fresh pineapple. I was 17 years old and vacationing in Honolulu with some girl friends. On our very first morning, you can surely guess what I ordered for breakfast. Yup, you’re right – pineapple pancakes, and that gorgeous stack was garnished with succulent chunks of fresh pineapple. As I popped one in my mouth, I gasped, “This is pineapple? OMG! “(or some equivalent expression of the era). It bore absolutely no resemblance to the blah canned stuff I had been eating all my life. Well, for the duration of the holiday, I gorged myself on my new passion. I just couldn’t get enough. To this day canned pineapple always tastes like a distant imitation of the real fruit; it just doesn’t cut it! All this to say that whenever we can, when cooking, we should not deny ourselves the use of fresh fruits when they are available: it makes a startling difference. Such is the case with today’s recipe. Fresh pineapple will elevate the flavour of the dish to lofty heights and allow the other spices to sing. I hope you like this recipe as much as we do in our family. It is brilliant with fish and chicken recipes. Add the rice and salt to the water in a medium saucepan. Bring to a boil. Reduce heat to low and cover. Cook for 12 minutes and remove from heat. Fluff gently and remove to a large bowl. Melt the coconut oil in a medium skillet. Add the onions and sauté until they begin to turn golden brown. Add the mustard seeds and minced ginger and sauté until the mustard seeds begin to pop. Add the garlic and spices and sauté until fragrant. Add the onion mixture to the rice and mix gently. Add the pineapple and rice-wine vinegar and gently incorporate. Serve with chicken, fish or seafood. This recipe is modified from Molly Katzen’s Vegetable Heaven. Hi Juliana, what a fun recipe and presentation. The pineapple shell makes a lovely serving vessel, I will have to remember to try that sometime. This rice looks positively tropical and the kick of spice is a fun addition. Bravo! Um…Ngan stole my words! So, ditto! Great recipe, I bet the scent alone makes this worth a try! Great recipe! And what timing! We were watching a show on telly last night about British pineapples! Did you know they grew them in England ? Are you kidding me? You have the very same climate as we do here in Canada, and I can’t imagine them being grown here! They must be growing them in greenhouses! Let me know how they taste! 🙂 I’d be very interested to know. Seriously ! It’s an old English thing.. Maybe kew and some if the old statleys still do it.. We have lodges based on pineapples ..
Wow! I had no idea! But this is very interesting to learn! I’ll have to google it to learn more! Hey Fae, thanks for the lovely comment. I hope you can find a big, fat, juicy one! They seem to be really good this time of year! So much flavour! Beautiful! I love pineapple too!! It looks awesome, Julianna 🙂 I love your presentation, you bring Honolulu on your table ! Hey Linda! Yes, and the fragrance of pineapple brings Hawaii to my whole house! Mmm, so wonderful! I read spicy and then pineapple and then rice and here I am with a fork ;). Absolutely gorgeous recipe. Bookmarking to try. I guess I’ve been spoilt, growing up in an area surrounded by pineapple farms. They are one of my favourite fruits, and this dish looks just gorgeous! Oh thanks! You are too lucky to have fresh pineapple where you live! you are an artist dear friend! Love the presentation Julianna! Looks like a delicious accompaniment to many a dish! Hi Patty! Yes, I have tried Thai pineapple fried rice and just love it! Mmmm, so much rice, so little time, huh? See you at FF? I haven’t been at FF in a month! The end of the school year was crazy hectic and I’m just settling into summer mode. I will be back soon, though! Well, I noticed that you have been very quiet lately! We have missed you. Looking forward to seeing you again once things settle down! Yeah! Summer is almost here! If it’s possible for a rice to taste refreshing…I think this is the one! Sounds delicious, Julianna. Now, I just need to find a pineapple in Michigan that tastes as good as those eaten on a Hawaiian beach! LOL! I sure hope you can find one, Nancy!! It’s pretty easy here on the west coast because I think we get direct shipments from Hawaii! Do you know that I even saw them in Costco yesterday? How are you feeling? I’m healing well and gradually doing a bit more each day…thanks! Well, I say, plan a trip! It would be like this: “Honey, we have to go to Hawaii. 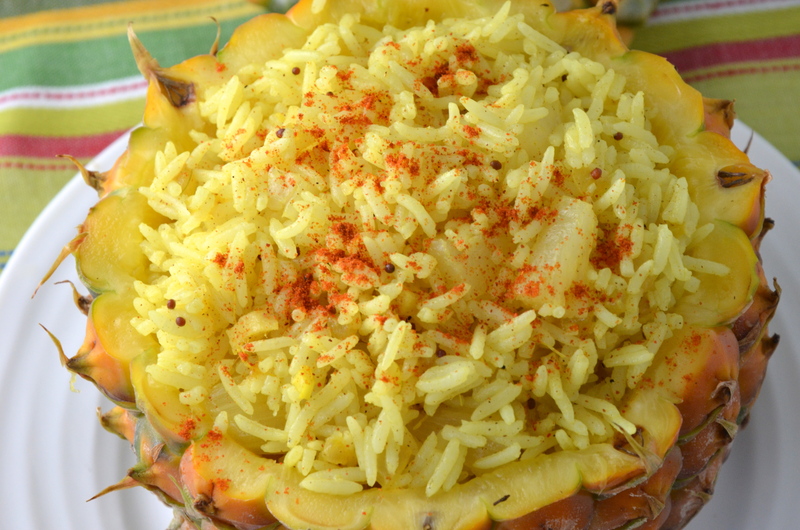 I’m making this awesome rice dish and I need to buy a field fresh pineapple…”! I hope it works! LOL! So glad to hear that you are healing well. There is so much to be thankful for in life. I love pairing fruits in unusual ways. I’ve done grilled peaches on a grilled cheese sandwich and strawberries with lemon pasta, both with success. I adore the sound of this dish. Pineapple and rice all mixed together. It sounds like a dream come true. Thank you for sharing. What a lovely and original bowl Julianna! 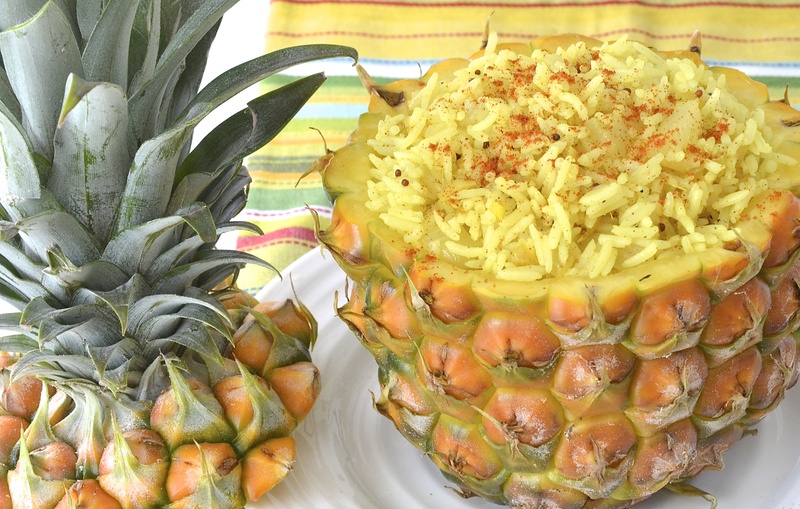 I love pineapple too, but I’ve never imagined to use it with rice! Very intriguing! Thanks Margherita! 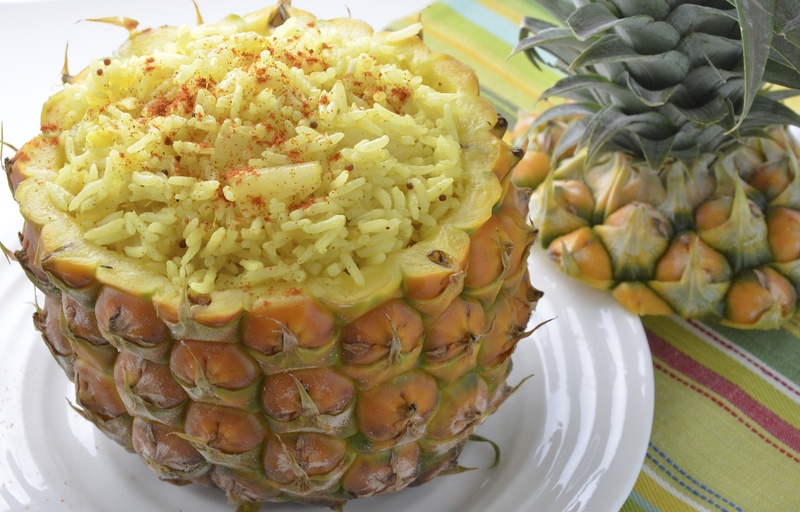 I think you would really like pineapple in rice. The pineapple makes it much fresher and lighter! Have a great week! I had pineapple fried rice before, but i totally prefer your method of mixing better. I am glad you like fresh pineapple, too; I have them every chance I get when I go home (in Thailand). It’s so much better, isn’t it? Yes, I agree! Sometimes fried rice can be a bit greasy, so whenever I can avoid the extra oil, I like it. And always, fresh pineapple is just so much more flavourful than canned. I love that this is served in an actual pineapple! I love pineapple rice 🙂 I wish I remembered the first time I had fresh pineapple, though I can’t even remember the last time I had canned! Just came upon this, holy cow it looks amazing – yum! What a genius! Your recipe looks amazing! Thanks so much for the lovely comment, Kloe! Hi Dimple! That is very sweet of you! I will go over and have a look in a bit!